NIA CHARLESTOWN NEVIS (December 01, 2016) — Premier of Nevis and Minister of Finance in the Nevis Island Administration (NIA) Hon. Vance Amory says in an effort to empower youths in the fight against crime and violence, the Administration will continue to invest and encourage investment in industries that create jobs, provide opportunities for self-employment, earn foreign exchange and improve standards of living. He was at the time delivering the Budget Address at a sitting of the Nevis Island Assembly on November 30, 2016. He said the Administration believes that the social undercurrents which exist on the island give criminality its roots and they have to be addressed in the continued efforts to restore a safer and crime-free environment in Nevis. The Premier also noted that the NIA will continue to focus on human resource development that will provide opportunities for the people of Nevis to live healthy lifestyles, take part in decision making, obtain decent work and improve their overall social and economic wellbeing. 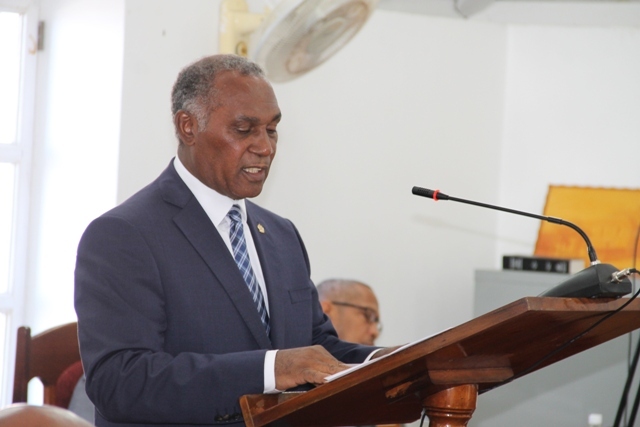 Mr. Amory, explained that the Administration has allocated resources in the annual budget to supplement the Federal budget allocation, to better enable law enforcement officers to have the necessary equipment and other resources to effectively carry out their duties on Nevis. “As a demonstration of our commitment to law and order, my Administration has created a new division in the Office of the Premier called the Security Services Division to support the work of the federal law enforcement agencies. “This unit will incorporate the work of the Immigration officers, Close Circuit Television (CCTV) operators, Traffic Wardens, all of whom are paid directly by the NIA but fall under the direct supervision of the Nevis Division of the Royal St. Christopher and Nevis Police Force,” he said. Funds allocated to the unit will also be available to support the work of the police, as the Administration continues to equip them with the necessary tools, equipment and training. Mr. Amory explained that additional funds were recently allocated for the construction of a K9 kennel on the grounds of the Cotton Ground Police Station, with the intension of establishing a permanent and fully-operational K9 Unit on Nevis. It will support the work of the Police and Customs Department. The Administration was also in the process of finalising plans for the construction of a new $4.2million Police Station in Newcastle. Work is expected to begin in the second half of 2017 and be completed within 14 months. In conclusion, Mr. Amory said criminal activity retards the economic process, stifles growth and terrorises communities. Therefore, the Administration stands committed to maintaining peace and stability and reducing criminal activity to a zero level, by exploring all available options.